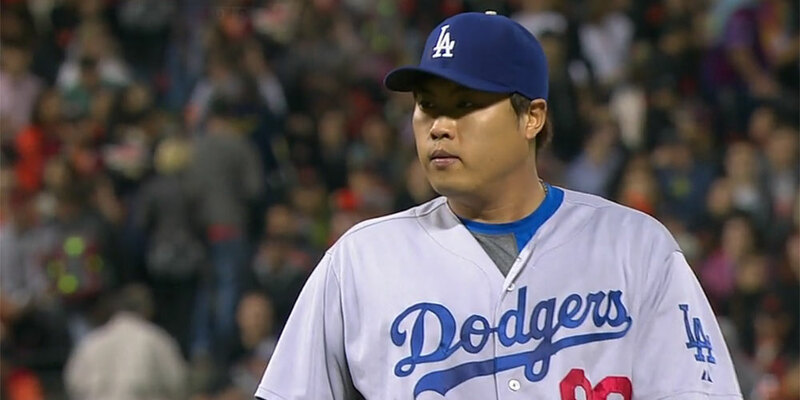 Hyun-Jin Ryu‘s performance against the Giants last night was a pleasant sight. Despite his lack of fastball command in his first three starts, Ryu did a much better job of that last night. I touched on his overall performance a bit in the recap. His fastball averaged 90.9 MPH on the night and topped out at 92.9 MPH. That’s a step up from where he had been so far this season (89.9 MPH), but what I really want to focus on is his changeup. Ryu threw 40 changeups last night in 96 pitches. Of the 40, he threw 20 of them to left-handed hitters. Michael Bertram Petriello made this observation after I tweeted out the info about Ryu’s changeup usage. He was behind Jeff Locke (27) and John Danks (22) for number of left-on-left changeups. Ironically, Locke’s game was against the Giants in June of last season (Danks was against the Yankees in 2015). Coincidentally or not, each pitched fared well in their outings, as Locke threw 6 2/3 scoreless innings and Danks threw six innings of 2-run ball. It was easily his highest usage rate and raw count against lefties in his career, and the Giants’ left-handers didn’t do much with it. Ryu threw 15 of them for strikes, got three swinging strikes, three balls in play and just one single off it. In his career, he has allowed just a .206 batting average against his changeup to lefties (four singles, one double, two home runs) and a 14.2 whiff rate (highest of any pitch he throws against them). It was a noticeable increase in same-handed changeup use — something I’m a big fan of. If a pitcher can control and command the pitch well enough, why not throw it against the same-handed hitter? Tom Glavine got into the Hall of Fame doing that and Johan Santana regularly threw left-on-left changeups during his incredible peak. Ryu’s fastball isn’t where it once was, so having a pitch as good as his changeup to fall back on — and it’s even better against righties — can only be a good thing.